You just cannot have a holiday gathering without serving this crowd-pleasing jalapeño popper recipe. Topped with a sweet, savory and not-too-spicy cranberry bacon jam, you might need a few extra peppers! 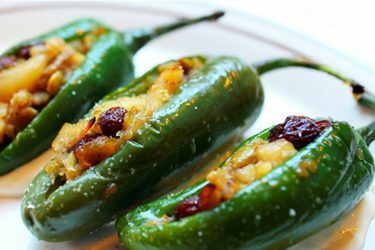 Jalapeño poppers have grown in popularity the past few years. 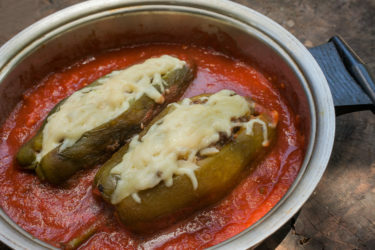 Even your friends who don't really care for spicy foods are willing to try cheese-stuffed peppers. Add bacon into the mix, and suddenly they are the favorite appetizer at the party. 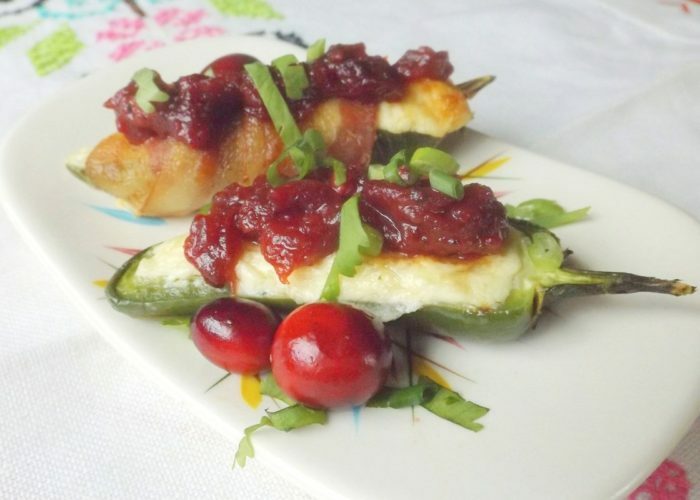 It's so easy to dress up your jalapeño poppers for the holidays. Roasted cranberries, combined with smoky bacon and aromatics yield a delicious jam that can be enjoyed year-round and in various dishes. You can simply serve the jam over a brick of cream cheese with crackers for a breezy, easy appetizer. But why stop there? Delight your friends and family with this not-too-tricky recipe this holiday season. Preheat oven to 400ºF. In a baking dish, combine the cranberries and 2 tablespoons of oil. Season to taste with salt and pepper. Roast the cranberries for 20-25 minutes or until cranberries begin to pop open. Remove from oven and set aside. In a skillet at medium heat, cook the bacon until brown and crisp. Transfer to a plate lined with paper towels. Remove all but 1 tablespoon of bacon grease from skillet. Heat to medium. Add the onions, garlic and jalapeño. Saute for 5-6 minutes. Add the cranberries. Using a potato smasher, smash the cranberries until broken down completely. Add in the brown sugar, orange juice and vinegar. Fold the bacon back in and stir well to combine. Season with salt and pepper to taste. Taste for sugar as well. Simmer on low for 5 minutes. Remove from heat. Preheat oven back to 400ºF. Line a baking sheet or dish with foil or parchment paper. Set aside. In a bowl mix together the softened cream cheese, manchego and white pepper. 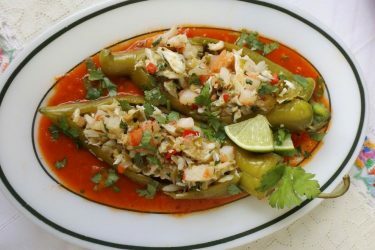 Fill the jalapeño halves to the top with cheese mixture and place on baking sheet. Bake in preheated oven for 10-12 minutes, then broil just to brown the cheese a little more. Remove from oven and let sit for a few minutes. Spoon on some of the cranberry bacon jam onto each popper. Garnish with green onions and cilantro. To prepare the bacon-wrapped version: You will need one strip of bacon per popper. If needed, use a toothpick to hold bacon in place. Bake on a baking sheet lined with a metal rack in a preheated 400-degree oven for 30-35 minutes. Move under broiler for 1-2 minutes to crisp up the bacon a little more.